Sinnathamby Rajaratnam, (S. Rajaratnam) was a product of London’s institutions of higher education at a period he described as a “vortex of political ferment”. As he saw it, those formative years (1937-1947) were spent amongst Indian nationalists for whom “the written word was a weapon of social protest and a means of exposing injustice and exploitation,” equipping him for his criticisms of the political landscape when he returned to Malaya. His political proclivities were intensified when he came into contact with nationalists such as Mulik Raj Anand, Krishnan Menon, Louise MacNeice, and Dylan Thomas as part of the Fabian Society and Left Book Club. He turned his hand to writing as a means of supporting himself, and eventually worked for some years at a London newspaper and as a correspondent of the Bombay Free Press Journal. He also wrote short fiction that was published in Asia magazine and other journals as well as radio plays in 1943 for George Orwell’s BBC radio programme for the East Indian Service. ‘Raja Ratnam’ was the moniker he adopted when he began writing both creative short fiction and broadcast plays and continued using as a journalist in Singapore from 1947-1959. In early 1947, Rajaratnam returned to Seremban, Negri Sembilan. It is here that our story begins, with Rajaratnam as a young journalist in his early 20s, with a Hungarian wife, Piroska Feher and without a law degree. However, he lost no time making new connections and on 11 June 1947, received a letter from E. Maurice Glover, managing-editor of the Malaya Tribune (MT), who invited him to write for the paper on probation. He was a cub reporter with the MT from 1947 to 1950, leaving to join the Singapore Tiger Standard (STS) from 1950 to 1954 as Features Editor and Leader writer. He then published his own journal, Raayat, from December 1954 to March 1955 (discontinued after 3 months), before moving to Straits Times (ST) as the Chief Editor. He also wrote radio plays for the Singapore Broadcasting Corporation (SBC) during this period and served as the correspondent for The Observer in London, sending it one consultative cable every Friday and an airmailed situation report once a month. Besides that, he was also a contributor to Jana – the news magazine of resurgent Asia and Africa in the mid-1950s. During this period, Rajaratnam was beginning to negotiate the twin complexities of decolonisation and the Emergency in Malaya and Singapore. He spent significant effort composing sharp analyses and at times delivered searing criticisms of the competing political parties. As a journalist, he was among those attempting to assert their vision on what should constitute ‘Malaya’ – and, the role that Singapore was to play in it. The story of Rajaratnam, as an intellectual and journalist has been overshadowed by his significant contributions in the political arena. Rajaratnam’s literary transformation, from working at STS to becoming the sole proprietor of his own magazine reflected the type of content he wanted to publish and his style of writing. Once liberated from the tentacles of a newspaper editor’s control, he could express a higher degree of literary experimentation and creative stylistic forms and genres. As a philosopher-journalist embroiled in the war of words and ideas between the communists and the British in Malaya, Rajaratnam’s stance was not anti-British as such, nor anti-communist, but anti-colonial. As an English-educated intellectual, he challenged the colonial powers while writing in the language of the Empire and sharing a Western cultural inheritance that prized the pursuit of liberty and humanistic ideals. Rajaratnam’s weekly STS column ‘I Write as I Please’, a total of 50 articles, ran for a year from February 1953 to January 1954, paying homage to Orwell’s column ‘As I Please’ in Tribune (1943-1947). As the firm ‘I’ in the title denotes, Rajaratnam’s works during this period were entirely his own views and opinions. In the mid-1950s, Rajaratnam’s loyalties were not yet subject to the discipline of a political party, but remained very much defined by his experiences and the contemporaneous contingencies. The ‘I’ was an independent intellectual, a “one-man teacher, one-man university,” who was critical of the current leaders and the political system/the colonial system. The column, ‘I Write as I Please’ – and he did just that – reverberated in the political realm. 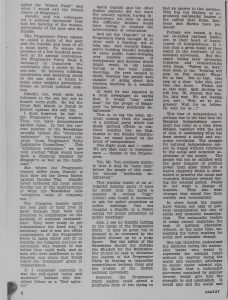 He incurred the ire of General Templer for an article that criticised the British high commissioner for inflicting the punishment of halving the rice rations and imposing a 22-hour curfew on the residents of Tanjong Malim for failing to inform the British of the communist activities in the area. However, Templer eventually let him off with nothing more than an implicit warning after ascertaining that Rajaratnam’s goal was not to incite communalism or to fan revolutionary flames. There were also run-ins with the Communist Party of Malaya members who burned his desk, and disgruntled white South African sailors who broke into his office and threatened to beat him up. Finally, he set up and ran his first and only publication – Raayat (the older spelling of ‘Rakyat’ the Malay word for ‘the people’) – between December 1954 and March 1955. 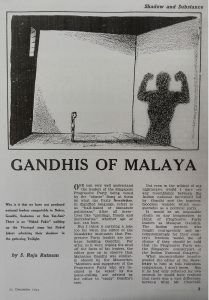 The publication, which he ambitiously declared to be ‘Malaya’s national English weekly’, was aimed at the “Thinking Malayan.” The weekly publication became a monthly from the fifth issue onwards, because low circulation coupled with the radical tone of his publications made it hard to draw advertisers. 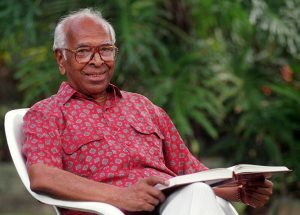 Rajaratnam was Raayat’s publisher, editor and contributing-writer. Its failure was a blow to him financially and emotionally. Irene Ng has described this period of his life as “a very public failure” and “one of the lowest points” in his personal life “where he lost tens of thousands of dollars”. Nevertheless in these pages Rajaratnam got to write as he pleased. When the PAP was inaugurated in November 1954 Raayat was still in existence. 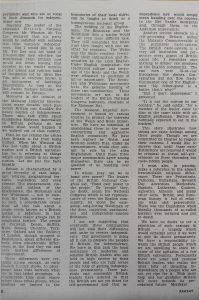 In a Special Branch Report, Raayat was described as “the unofficial mouthpiece of the PAP.” However the English-reading public was too small in size to sustain such a magazine. In any case, most of them were politically conservative if they were at all interested in politics. It was the Chinese-speaking who constituted the politicised masses. Every time I wrote commentaries for my newspaper, it was with a view to build a more fair, just and reasonable multi-racial society through democratic means without resorting to violence. ‘Raja Ratnam’ was a fierce critic of colonialism; he spared no effect to ridicule the government and its local supporters in Raayat using wit and irony. The criticisms were hard hitting and sharp, but since it was not a direct indictment of the current colonial system, it was difficult for the authorities to take action against him. Thinly-veiled behind the guise of a fantasy set in the future, he delivered his clear-eyed criticisms against the regime through satire and sarcasm in equal measure. 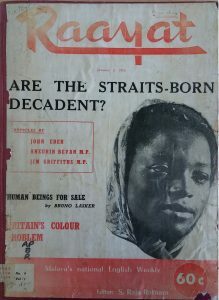 The two-article series, ‘When Malaya Ruled Britain’ and ‘Malaya must free Britain’ were published in 1955. They are set in the dystopian future of year 2055, where Britain was a colony of a rich and powerful Malaya. 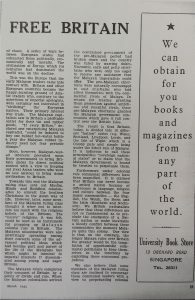 The first article is a ‘speech’ delivered by ‘Malaya’s Secretary of State for the Colonies before the Malayan Greater Empire Society’ and reported by ‘S. Raja Ratnam’. The author of the second essay is ‘the President of the British National Congress, Winston Ah Tee Lee’ with the article translated by ‘S. Raja Ratnam’. In the dystopian future portrayed, the position of British coloniser and colonised Malaya were reversed. This was a cheeky throwback to his earlier literary short fiction days, intersecting with his political journalism. The mirrored satire exposes the consonance between the fictional Britain he conjured and the reality of colonial Malaya, for the British similarly claimed to build their legitimacy on the justifications for colonialism proffered by the fictional Malayan colonial rulers. Leader of the left wing of the British Labour Party Aneurin Bevan makes an appearance in the guise of ‘Idrus Bee Van’ with his menacing band of ‘Bee Vanite’ followers. It was Bevan who brought in the National Health System to make health care available and affordable. Rajaratnam made Idrus/Bevan the leader of an ‘armed and ruthless band of insurgents’ who was an instrument of a hostile imperialist power, much the same way as the British portrayed the anti-colonialists who regarded themselves as Bevans, in wanting to introduce socialist welfarism for their people, but who were accused of being an instrument of communist China. He ends off his argument with the bold claim that, ‘we are unwilling to shirk (the responsibility towards the colonised British people)’ and it would be ‘utter folly’ to ‘thrust independence on a people who are not yet ripe for it’. Just as Britain was expressing such sentiment with regards to Malaya’s appeal for independence in similar terms. 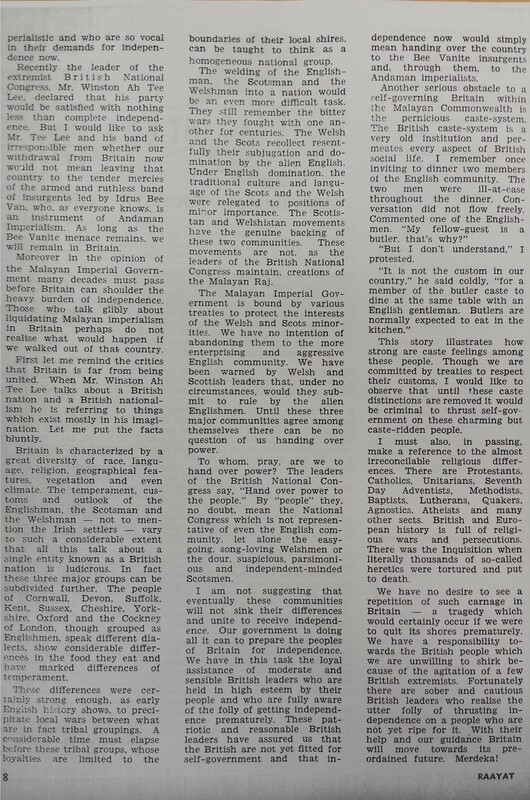 ‘Malaya Must Free Britain’ is a response by the ‘President of the British National Congress, Winston Ah Tee Lee’. Readers of the time would also easily recognise the thinly-veiled reference to British Labour Prime Minister Clement Attlee (1954-1951) and Conservative Prime Minister Winston Churchill (1940-1945, 1951-1955), then the incumbent. In addition, the colloquial re-framing of his name to ‘Ah Tee Lee’ also reveals the power and violence of language in dominating identity and convention. His role as the ‘President of the British National Congress’ is a reference to the Indian National Congress – the party of Gandhi and Nehru which in fact fought and won independence from Britain in 1947. In this meta-reference to the colonial situation, Rajaratnam cleverly uses the extended metaphor of a ‘wonderful story’ where resistance is ‘depicted’ as ‘treacherous villains’ to caricaturise the situation, blurring the line between imagined dystopia and historical reality – in a scene where taught history is more fiction than fact. He then set out a ‘brief review of how Malayan rule was imposed on Britain’. He asserts that the primary interest of the early Malayan traders was certainly not the ‘civilizing’ mission although they subsequently converted the ‘Heathen Christians to the Asian way of life’ to protect their economic ‘vested interest’. Rajaratnam was able to synthesise large swathes of history and speak as an intellectual on the economic motive for the colonising imperative. And to the Malayans who loudly proclaim their love of freedom may I quote to them the words of the great Ancient American, Abraham Lincoln: “Those who deny freedom to others deserve it not for themselves. Rajaratnam also used Raayat to launch clever, withering criticisms of the established political parties in Singapore during the early days of the PAP. The Progressive Party (PP) was then the main political party, favoured by the British for its timid stance on decolonisation and groomed as its heir. It made claims that it wanted to end British rule, but was in no hurry for this to take place. Instead as the PAP pointed out, the Progressives, the majority of whom were Straits Chinese and English-speaking, were willing to let the British to decide when to grant piecemeal constitutional rights. The PAP however claimed to speak for the masses and was demanding Merdeka and rule by elected parliamentary majority as soon as possible. Raja Ratnam summarised clearly, “it would an impossible strain on any imagination to think of Progressive Party leaders as Malayan Gandhis”. He noted mercilessly with his rapier-like pen that while the Progressive Party held its annual conference with a picnic by the beach in order to boost attendance, “Gandhi too went with his followers to the sea but not to munch curry-puffs.” The ascetic Gandhi in his home-spun dhoti, the advocate of non-violence non-cooperation had brought India’s nationalist movement international notice when in 1930 he led a 240-mile march to the sea, gathering followers along the way, to protest the taxes that the British had imposed on producing salt from the sea, a source of livelihood of the locals. The contrast to the anglicised bankers, lawyers and businessmen in the Progressive Party could not be greater. In Rajaratnam’s words, the PP leaders were saying – “We the leaders are fit to govern. But you the people are not.” Yet, Rajaratnam’s conception of democracy did not necessarily place power in the hands of the “people”. All that is expected and desired in a democracy is that the people should express in broad terms their preferences for certain objectives and ideals that may be put before them by political parties or individuals. The people tell the leaders they elect, what they want and leave to them the task of how this is achieved. 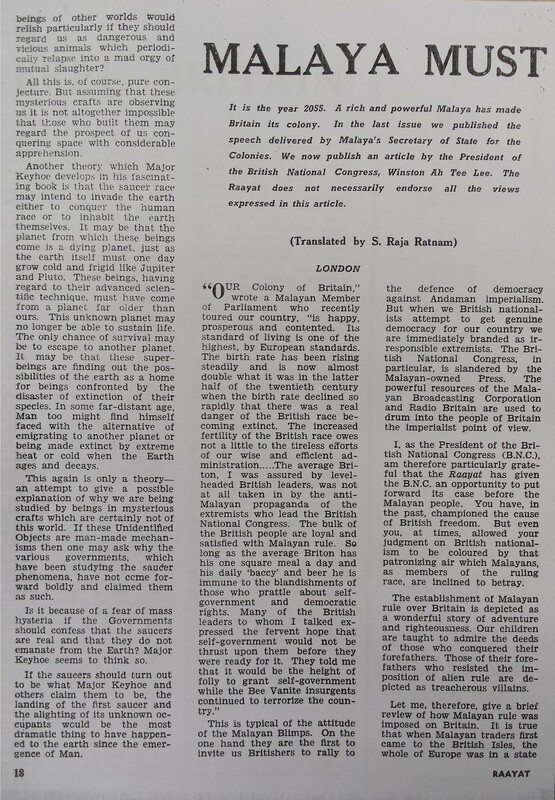 This conception of a limited democracy was close to the “colonial democracy” advanced by the British during this period – political debate and political expression was to be made through “the natural leaders of the people” presenting “the concerns of their communities in colonial welfare councils and legislative chambers.”  It was evidently influenced by Rajaratnam’s views of political developments in other countries that had thrown off – or were in the midst of throwing off – the yokes of colonialism, such as Indonesia, China, India and Burma. There, “the history of nations is being shaped not by a traditional ruling class, but by that chaotic, turbulent, and at times frightening entity known as the masses.” This has been the Singapore PAP government’s preferred approach to democratic politics since it came to power in 1959. Rajaratnam’s role as an intellectual in society shifted from being a critic of authority as a journalist, to a politician of the newly established order upon his election as Minister of Culture. However, his early political editorials stand as testament to a period where Rajaratnam wrote as he liked in fighting for his cause. His writings of the time, brimming with sarcasm and wit, present to the reader an individual who crafted the necessary narratives to engage and challenge the powers that be – that had also run their course. Ho Jin Yee graduated from the NUS History Department in 2015 and has since become a PR professional. Her exploration into young Rajaratnam’s writings is an attempt at preserving his literary legacy and highlighting its impact on Singapore’s historical narrative. S. Rajaratnam, Dialogues with S. Rajaratnam, Former Senior Minister in the Prime Minister’s Office, ed. Hwee Suan Ang, trans. Seng Giap Lee (Singapore: Shin Min Daily News, 1991), 90. “Straight From the Heart,” Malaysian Business, May 1, 1994, 24. Philip Holden, “Rajaratnam’s Tiger: Race, Gender and the Beginnings of Singapore Nationalism”, The Journal of Commonwealth Literature, 41:1 (2006):128. “Back in Malaya,” The Straits Times (ST), March 2, 1947, 7. Institute of Southeast Asian Studies (ISEAS), Private Passion: The Photographs of Pioneer Politician and Diplomat S. Rajaratnam (Singapore: ISEAS 2011), 2-3. 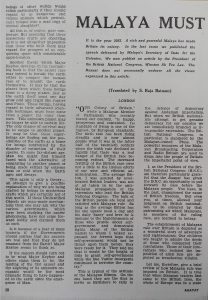 S. Rajaratnam Private Archives, ISEAS, June 11, 1947, SR_113_113, 5399. S. Rajaratnam Private Archives, ISEAS, April 5, 1950, SR_113_119, 5405. S. Rajaratnam Private Archives, ISEAS, September 3, 1975, SR_113_116, 5402. 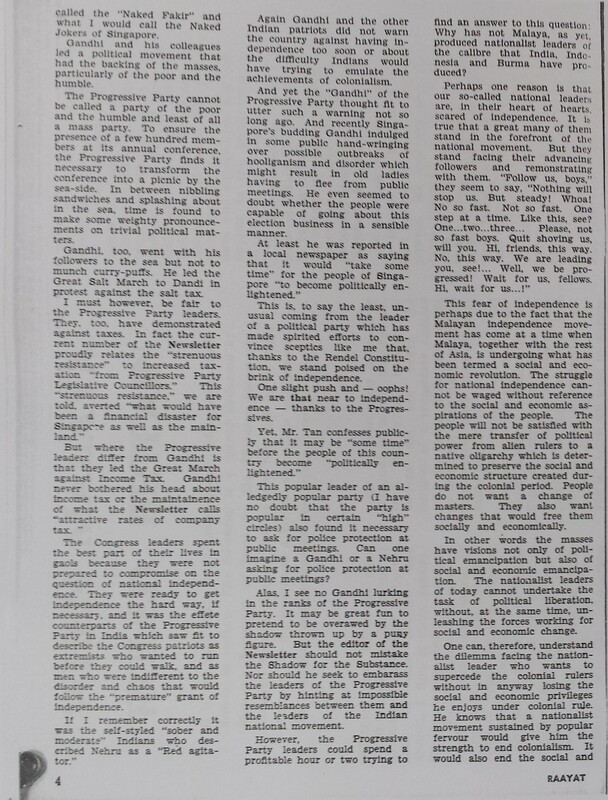 The Business Times, October 6, 1988. 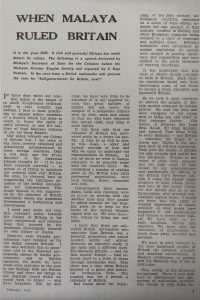 Constance Mary Turnbull, Dateline Singapore: 150 Years of the Straits Times (Singapore: Times Editions for Singapore Press Holdings, 1995), 178. S. Rajaratnam, “We Believe…,” Raayat, December 13, 1954, 1-3. Syed Hussein Atlas, Intellectuals in Developing Societies, (London: Frank Cass and Company Ltd, 1977), 9. Rajaratnam, Dialogues with S. Rajaratnam, 90. S. Rajaratnam, “When Malaya Ruled Britain,” Raayat, February 1955, 7. 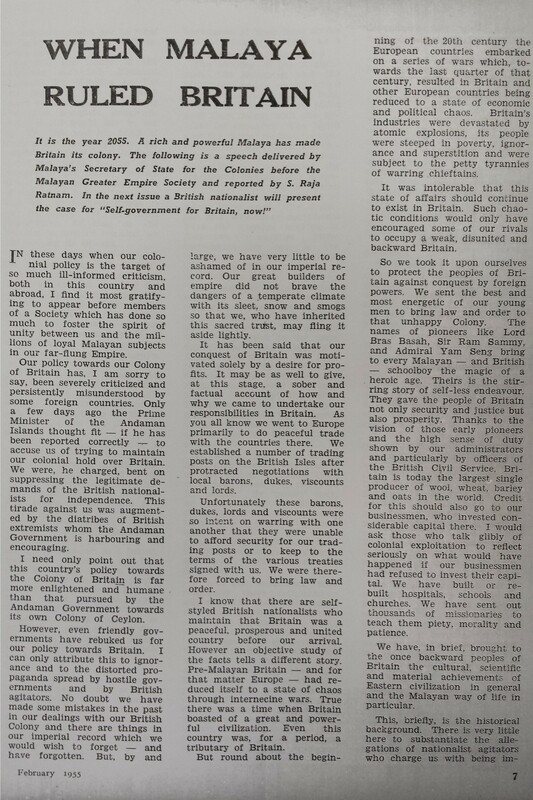 Rajaratnam, “When Malaya Ruled Britain”, 7 and S. Rajaratnam, “Malaya Must Free Britain,” Raayat, March 1955, 18. 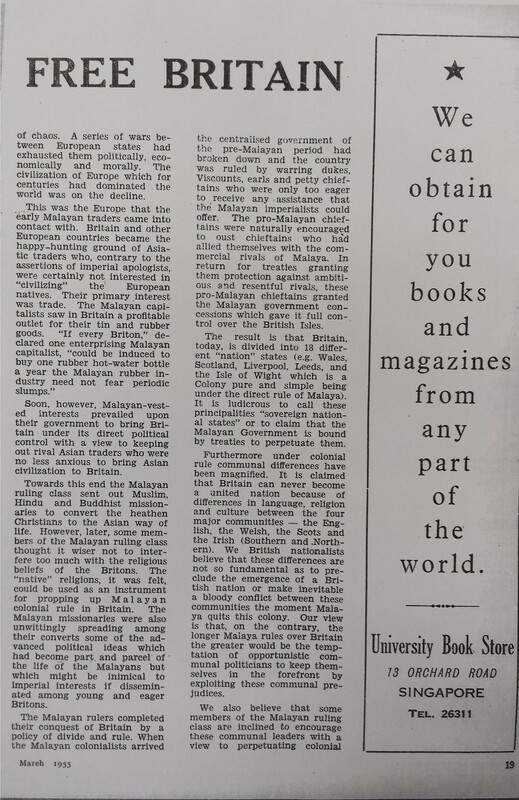 Rajaratnam, “Malaya Must Free Britain,” 18. S. Rajaratnam, “Gandhis of Malaya,” Raayat, December 27, 1954, 3-4. S. Rajaratnam, “Not to Defend but to Create Democracy,” Singapore Tiger Standard, January 10, 1954, 10. T. N. Harper, The End of Empire and the Making of Malaya (New York: Cambridge University Press 1998), 75-76. S. Rajaratnam, “The Age of the Masses,” Singapore Tiger Standard, December 13, 1953, 10.